Hayfield's well dressings are being erected Saturday 30th June, reflecting much hard work, with the Blessing of the Wells due the following day, Sunday July 1st, starting at 2.00p.m. on Bank Street. Again, another great local institution whose products never fail to inspire...….enjoy, and support! last, this is early notice of Sustainable Hayfield's (very brief) Annual General Meeting, Thursday July 12th, 7.3op.m. followed by some talks on how we can all reduce our reliance on plastic, which is threatening our ecosystems, our planet and even our own - and new-born babies' - bodily functions. 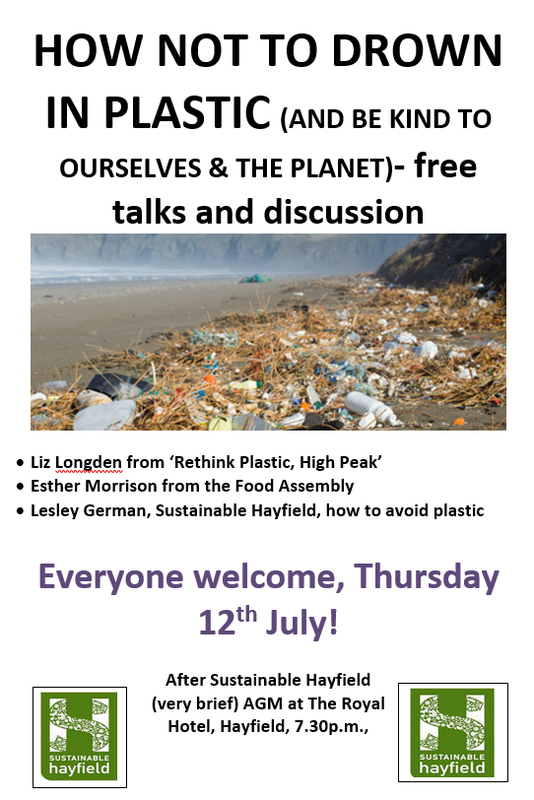 Collectively entitled 'How Not to Drown in Plastic (and be kind to ourselves and the planet)', we'll have contributions by representatives from Rethink Plastic High Peak, The Food Assembly, Sustainable Hayfield.....and maybe more! There's almost nothing more topical than this subject at present, and we hope to pick up some practical suggestions for how we can manage better without many plastics. please make a note in your diaries now: we hope to see you there!